Nelson Mandela felt so betrayed by Tony Blair's decision to join the invasion of Iraq that he made a furious phone call to a UK minister to protest. Labour MP Peter Hain, whose biography of the ex-South African president is published on Monday, said Mr Mandela was "breathing fire" down the line. The former Welsh Secretary said Mr Mandela felt Mr Blair's good work was "blown out of the water" by the war. Mr Hain said the criticisms were made formally, not in a private capacity. He said: "He rang me up when I was a cabinet minister in 2003, after the invasion. "He said: 'A big mistake, Peter, a very big mistake. It is wrong. Why is Tony doing this after all his support for Africa? This will cause huge damage internationally'. 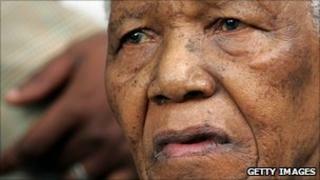 "I had never heard Nelson Mandela so angry and frustrated. "He clearly felt very, very strongly that the decision that the prime minister had taken - and that I as a member of the Cabinet had been party to - was fundamentally wrong and he told me it would destroy all the good things that Tony Blair and we, as a government, had done in progressive policy terms across the world. "He was always full of praise for the way our government had trebled the overseas aid and development budget for Africa; he just felt that all of this had been completely blown out of the water by the Iraq invasion. "I know Nelson Mandela quite well. He was virtually breathing fire down the phone on this and feeling a sense of betrayal. It was quite striking." Mr Hain said he told Mr Mandela that he respected his feelings but that the prime minister "acted out of conviction". "I think I said we would simply have to judge it historically whether it was the right decision. But he was adamant that we could not wait for history." Mr Hain grew up in South Africa, where his anti-Apartheid campaigner parents knew Mandela - whom he now describes as "a friend and a hero".